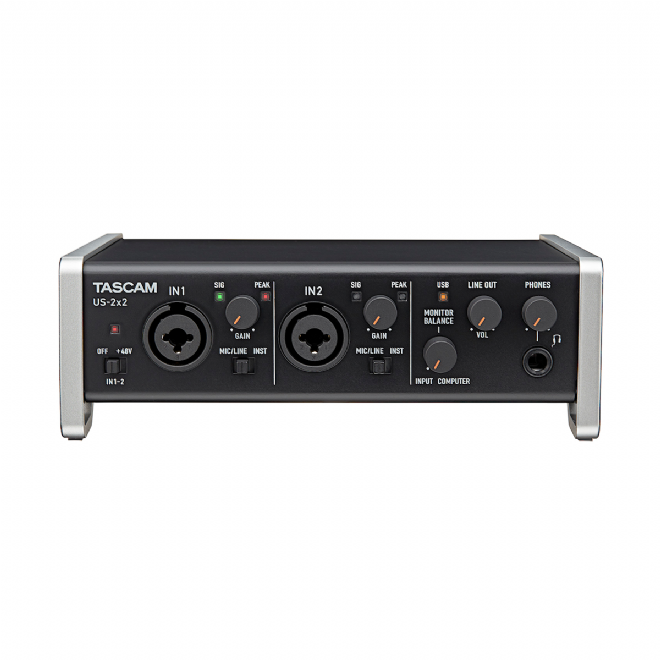 The Tascam US-2x2 is a 2-input / 2-output USB audio/midi interface for use with PC's and Macs. It is designed as a high quality sound interface that acts as an external sound card with 96kHz/24-bit quality - ideal when you are looking to record your own material. On the inputs, Tascam have provided two Ultra-HDDA mic preamps giving you a source with an extremely low noise floor. These inputs are on Combi-sockets allowing the connection of both XLR and Jack connectors. Phantom power is also available for use with condenser microphones. A switch allows the selection between mic and line levels to match the input signal level. Individual gain controls are also provided for each input on the front panel. On the output side, the unit has two 1/4" TRS balanced analogue jacks on the rear whose level is controlled via a single rotary control on the front. In addition, a 1/4" headphone jack is supplied for monitoring with its own independent level control. The unit takes its power directly from the USB 2.0 bus so no external power supply is required. The US-2x2 is an ideal 'first' audio interface for those starting out with computer recording. It is quick and simple to set up and use. The unit is also bundled with a copy of Cubase LE recording software - giving you everything you need to get started on your recordings. The unit is supplied complete with USB cable, manual and recording software.